the best two things this week & nothing compares to the first one! I literally shouted out loud when I saw this on Jennifer's blog this morning. 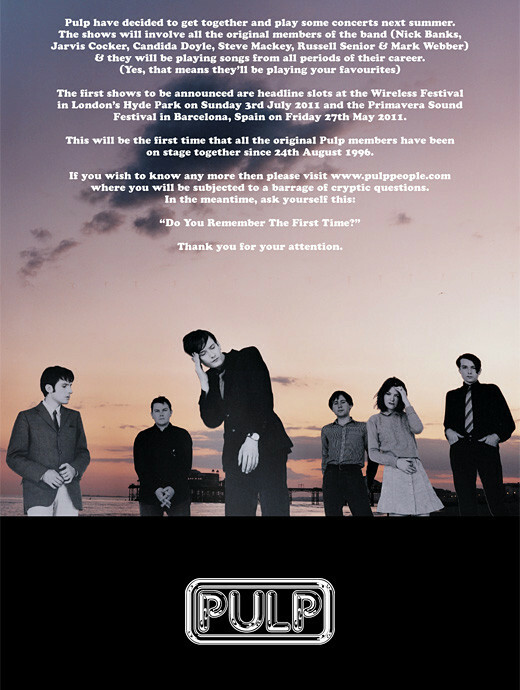 Pulp is my favorite above all favorite bands and I'm crossing my fingers that they make it over to this side of the ocean this summer. More cryptic info here. I have an amazing Pulp poster I got about six years ago from their single "Mishapes" and it's layout is a vintage sewing pattern- I keep saying I'm going to frame it and put it in my studio- I think it's about time! Oh, and Grinderman is this Saturday - is it dorky I'm so excited for this? I feel like a teenager all over again. Then there's this. I think this is best youtube video I've seen in a while. 1. What the hell is this lovebird doing??! 2. This is the kind of video your parents take of you and embarrass you with ten years later. Nothing like kid & pet videos - I recently saw one of me and my two bunnies outside when I was little - I think I was trying to get them to hop and so I started shoving and lightly "kicking" them - man kids are crazy! And I was one of them.